Magnesium Intake Reduces Incidence of Stroke—Major Analysis of Studies Confirms. The researchers conducted a meta-analysis which is a type of study that involves taking the data from previous similar studies and combining them. This analysis found that for every 100 mg increase in magnesium intake, risk of ischemic stroke (these are the strokes caused by blood clots in the brain) was reduced by 8%. Ischemic stroke occurs as a result of an obstruction within a blood vessel, a partial or total blockage of an artery supplying blood to the brain. It accounts for 88 percent of all stroke cases and according to the Internet Stroke Center, stroke is the third highest cause of death in the United States. Dr. Carolyn Dean, MD. ND, magnesium expert and medical director of the Nutritional Magnesium Association at www.nutritionalmagnesium.org says “A burst or clot-blocked blood vessel in the brain is all it takes to cause a stroke which results in the destruction of critical brain functions. Stroke is said to be caused by hypertension, atheriosclerosis and/or diabetic complications all of which are associated with magnesium deficiency. Since hypertension is one of the risk factors for stroke, does magnesium also lower the risk factor for high blood pressure? In a Harvard study, doctors at the Harvard School of Public Health determined the relationship between diet and hypertension (high blood pressure). The study involved over 30,000 male health professionals 40 to 75 years old. Another risk factor for stroke includes diabetic complications. Can magnesium reduce the incidence of diabetes? In an April 2009 study published in the American Journal of Epidemiology, researchers at Stockholm’s Karolinska Institute reported that for every 100 milligrams increase in magnesium intake, the risk of developing type-2 diabetes decreased by 15 percent. Noting that magnesium plays an important role in the secretion and function of insulin, Dr. Dean says, “Without magnesium, diabetes is inevitable. Measurable magnesium deficiency is common in diabetes and in many of its complications, including heart disease, eye damage, high blood pressure, and obesity. 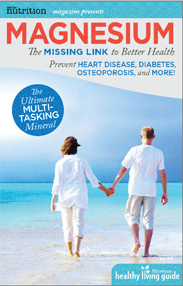 When the treatment of diabetes includes magnesium, these problems are prevented or minimized. Stroke has devastated the lives of 4.6 million Americans and 15 million people worldwide. Each year about 700,000 new strokes occur, along with 100,000 recurrences and statisticians say that the incidence of stroke is on the rise. Keeping bllos vessels strong, preventing blood from clotting inappropriately and even healing stroke damaged areas of the brain are all within the scope of the miracle of magnesium.